Hyundai, the South Korean car giant, is all set to sizzle the little above entry level popular car market with the launch of its all new second generation Santro on October 23. It will also be the global premier of the all new Santro in New Delhi as it will be exported to international markets, including Europe. Estimated to be priced between Rs 3.5 lakh to Rs 4.5 lakh for the Indian market, the sleek and stylish Hyundai Santro unveiled last week at its factory, near Chennai will certainly give dominant market leader Maruti Suzuki, Tata Motors and others a run for their money. The new Santro’s direct competitor will be the Maruti Suzuki Wagon R, Maruti Suzuki Celerio and Tata Motors Tiago. Compared to 1998, when the original Hyundai Santro was first launched giving a firm foothold to the auto maker, and phased out three years ago, the all new Santro has been built group up over the last three years with an investment of $100 million or about Rs 6,500 crore. “It will be the king of the roads in India once again and a game changer and a bench mark product in the Indian auto industry,” YK Koo, managing director and CEO at Hyundai Motor India told Financial Chronicle, soon after unveiling the car for the media at the factory. He said since its first launch in India, Santro created history with its numerous segment first innovations and became the complete family car for millions of customers. “The all new Santro is based on the six pillars: modern stylish tallboy design, comfortable and premium cabin, new age technology, customer centric safety, all round performance and complete peace of mind to become a benchmark product in the auto industry,” Koo boasted. But examining the car and driving it at the plant test road, the new Santro has all it takes to make it a killer winner in the fiercely competitive world’s fifth and Asia’s third biggest car market. Pricing will be the sole determining factor in the price sensitive Indian market which bought 3.2 million cars last financial year. Koo did not mince words when he declared that the new Santro is developed to meet the needs of the Indian families with a focus to create a masterpiece product offering customers a great ownership experience. For Hyundai, India’s second biggest car maker after Maruti Suzuki, Santro will be the volume grosser as the first time buyers make a beeline. Interestingly, since bookings were opened online from October 10-22 for the first 50,000 customers with a down payment of Rs 11,100, the company officials said they were surprised at the overwhelming response. Koo said he was confident that new car will meet the target. After an eventful 20 years in India, Hyundai’s decision to re-introduce Santro brand is considered a crucial attempt to by the auto maker to recover its market share it had lost to rivals in the growing small car segment, especially Maruti Suzuki which rules the roads, selling one car out of two bought in the country. The new Santro is Hyundai’s first new model in the small car segment after nearly six years. It has introduced the entry level car Eon in October 2012. The new Santro is also its first new model after the 2015 launch of its runaway success car the Creta, the sports utility vehicle. The new second generation Santro has been built on a new platform. While it retains the original’s tall-boy stance and profile, albeit with a modern twist, the roofline now mildly tapers towards the rear and the smaller bonnet now slopes down to a pert nose embellished with an extended, wide cascade design grille. The thin chrome elements at the front attempt to elevate the premiumness of the design. The fog lamps get a practical position at the two corners of the front fender and just under the headlamps. Also, the new Santro has grown in proportions on all sides, which reflects in the significant increase in the space available in the cabin, including shoulder room, which is now up to 95 mm compared to the previous model. The all-new Santro is powered by a 4-cylinder 1.1 litre petrol engine, producing a peak power of 69 PS. Mated to a 5-speed manual transmission, the car will also get an automatic transmission option with the AMT gearbox. The car will also be available in factory-fitted CNG-petrol variants. The brand new hatchback is the first of Hyundai car in India to get automatic transmission (AMT). The AMT is also the first to be developed by an original equipment manufacturer in-house. Both Maruti Suzuki and Tata Motors also offer it but both their AMTs are sourced from a supplier. Hyundai hopes that at least 30 per cent of Santro buyers will chose the AMT version. Hyundai claims that the new Santro delivers a fuel efficiency of 20.3 km/litre and the car has been tested for 7,750 km at speeds of 150 km/hr. The car has also been driven in temperatures as high as 40 degrees Celsius and as low as -10 degrees Celsius, and at elevations of 2,084 meters. The new Santro features a 7-inch touchscreen infotainment system with Apple CarPlay and Android Auto compatibility. The car will also be the first in the segment in the country to sport rear AC vents. ABS and airbags will come standard across all variants. Reverse parking sensors are made available on all trims while the top-end variants also receive a rear parking camera. Hyundai officials said the new petrol engine is compliant with Bharat Stage VI emission norms. With the norms slated to come into effect from April 1, 2020, the Santro will also be Hyundai's first car that is BS-VI compatible. Officials said the rural and semi-rural markets will be major sources of buyers for the Santro, and buyers from this segment will make up 50-60 per cent of the total sales of the car. “We are confident to sell 8,000-10,000 units of new Santro per month in the domestic market and achieve a 17 per cent market share this fiscal from the present 16.5 per cent. We plan to export an additional 2,500 units a month,” Koo said. He said the new Santro is competing in a 30,000-units-a-month market in the country. Interestingly, the market will wait and watch how Santro will disrupt the existing market as the popular Maruti Suzuki Wagon R alone accounts for half of that number at present. With the new Santro, the Hyundai brand now has a formidable line-up of products to increase its market share. 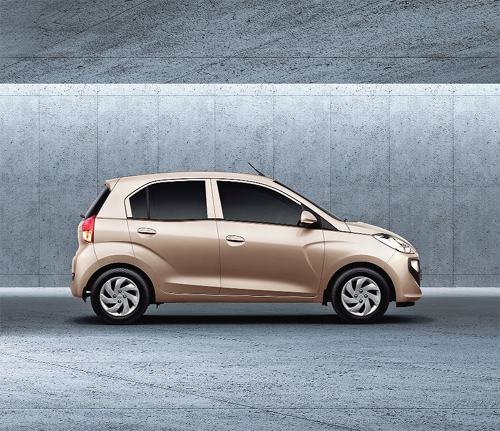 The Santro is positioned between the entry level Hyundai Eon and the Hyundai Grand i10.